Wilkes-Barre Times, May 29, 1899. On this date in 1899, Adrian Braun was electrcuted at Sing Sing. Braun was a hulking German cigar-maker with a reputation for habitually thrashing his wife. Authorities got involved when he bashed a neighbor who intervened in a beating so hard that it fractured the man’s skull. In August 1897, Braun caught a two-year sentence for assault. With her batterer put away, Kate Braun now had to shift for herself; struggling to make ends meet as a washer-woman, she had to give up two of her five children to the St. Joseph’s Roman Catholic Orphan Asylum. Still, she scraped together enough money to buy her incarcerated husband some sweets on a prison visit. Mr. Braun was at work peeling potatoes in the prison kitchen when he was summoned for the arrival of his spouse in March 1898. After using up their visiting time on a conversation that appeared entirely mutually affectionate, the two were about to part when Adrian Braun suddenly whipped out the potato-knife he had recently been employing and daggered the poor woman’s throat — with lethal effect. Braun never explained his shocking crime and pursued only a half-hearted insanity defense at his ensuing trial. 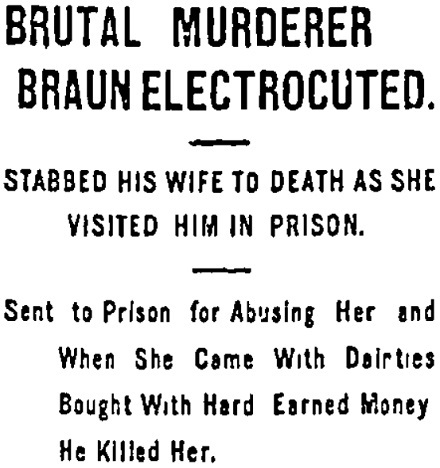 “No man was ever executed at the prison who had less sympathy than was felt for Braun,” the Wilkes-Barre Times reported on the day of the man’s execution.